The word renovation brings a lot of things to mind. It makes you think of torn down walls, new flooring, hard hats and stress. However, there is a no-stress solution to renovating your walls. Cover them with framed article plaques of your accomplishments. Create a space that represents all of your hard work and accomplishments. Regardless of the layout of your office and the amount of foot traffic you have, a decorated wall space is a constant motivator. It encourages your employees to work hard. It also brags to potential clients without saying a word. Not to mention how aesthetically pleasing it is to the eye. Use Framed Newspaper and Magazine Articles to Decorate Your Wall. Attractive: Our craftsmen use only the finest materials and finishes to ensure your article stands out on a wall. Distinctive: By utilizing empty space and filling it with your unique press, your can distinguish yourself from competitors. Important: Any press written about your hard work is important for you to acknowledge and for others to view. Relevant: Magazines and newspaper articles can be the best representation of your company. They are pertinent to your individual and company’s abilities. At the end of the day, it is nice to know there is a wall that symbolizes your growth whether as an individual or as a company. Hard work deserves recognition and a wall deserves to be decorated. 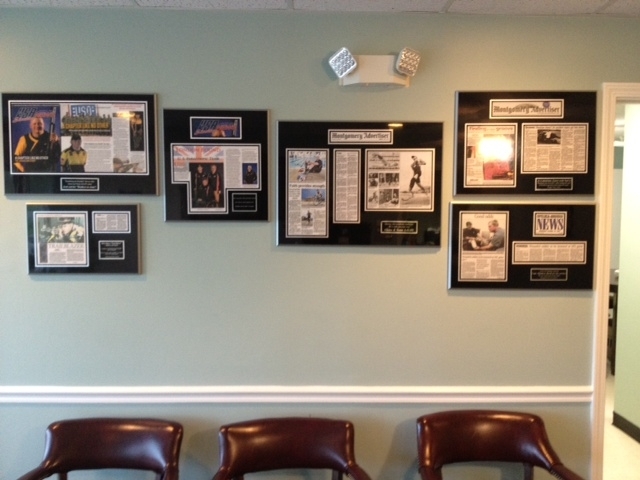 Give your wall personality by showcasing your articles laminated onto framed article plaques. Start on your road to renovation by clicking below and allowing us to transform your press articles in beautiful custom plaques. Do you have an article that you would like to see framed? See what it looks like online. View your custom plaque here. Have you ever seen a “wall of fame”? Please share below.